FreeVideoLectures.com: Research is showing that students are responding more favorably to visual learning experiences. Why not bring the learning to them in a way that they need it? Search this site to find free educational videos you can embed in your course or show in class. When you find a video you like, click the “embed” icon in the lower left corner. Use the code to embed in Blackboard. Follow the video instructions under #2, YouTube. YouTube, YouTubeEdu, and TeacherTube: I am not sure if there is one person who does not know about YouTube. The great part about YouTube and education is that all videos are open source, therefore, they are not copyrighted. You can search YouTube for videos related to your discipline and embed them in your Blackboard course. You can also find some motivational videos too. I like to use these as announcements sometimes too. VideoLectures.net: This is another source for video lectures. If you find a video you like, click on it and it will start playing. Under the video you’ll see something that says “Link this page”. It then has a sentence “Copy the HTML snippet!” Click the words HTML snippet. You’ll find the embed code on the next screen. Follow the directions in #2 above to embed in the course. TED.com: Ideas worth spreading. This website has thousands of videos from people all over the world discussing anything you can imagine. There are professors, geniuses, tech gurus, you name it. You can embed these videos just like youtube. MITWorld: A free site with over 700 videos from the fabulous world of MIT. Embed them like you would youtube by clicking these little arrows <> in the box that says “place on a webpage”. Digsby.com: If your institution does not have software to enable synchronous communication, using Digsby (or Meebo, or others that are out there) is a great alternative. This video shows you how to, once you’ve created a digsby.com account, get a chat widget and embed it into your Blackboard course so your students can see and contact you when you are online without them needing an IM account. This is Windows based. If you have a Mac, you can use Meebo.com instead. AUDACITY.COM: Free voice authoring tools that allow you to create audio files that you can embed in your course, add to power points, etc. Download the program. Windows & Mac based. 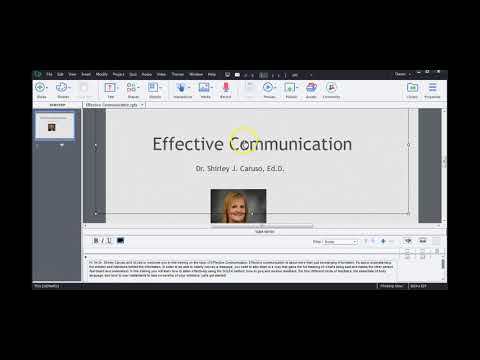 How to narrate a Power Point using Audacity and put it in your course. voicethread.com: this program allows students and professors to create voice-based posts based on a document, picture, or other type of document. Vocaroo.com: This makes recording any voice note, feedback, etc. so easy you won’t believe it. No account necessary. Has difficulty with Mac it seems. DimDim.com: Free web conference tool. Very easy to use. Nothing to download. Has video and audio. I suggest not using video because it takes up too much bandwidth. Sign up and you will have your own dimdim room, and others join through a web link. Only works with internet explorer. Video information. How to schedule a meeting. Look for other tutorials on YouTube. Voki.com: A really fun tool that allows you to create crazy avatars and record up to a 1 minute message using any of their voices (accents from all over the world), or by recording your own voice. Easily embeds in your Blackboard course. How to create a Voki tutorial. How to add a voki to your Blackboard class. Skype: This has been touted as one of the best tools for the internet many years in a row. It is basically like a free internet-based phone with conferencing, chat, and video chat capabilities. Fonomo.com: This website is similar to Skype in its capabilities. These tools can be used to have virtual office hours or conference with online students. Nothing to download and students access this through a weblink you share with them. Gogrok.com: Gogrok is basically an internet collaboration platform that allows you to screen share (you can take control of their screen), real-time collaboration and editing with others, and allows for internet voice and calling features too. In order to have voice, users must use Skype or MSN messenger. I have used this personally… and found it to be FABULOUS. Windows-based. Quizlet.com: This is a good resource to help students study. It’s based on flashcards and quiz games to help students memorize material. Teachers can use it by creating flashcard sets and sharing them with students, either in class, or virtually. A brief demo of how it works. Wiggio.com: Do you want a way for your students to interact in a group that’s more Web 2.0 (or 3.0) like without having to use Facebook? This might be your answer. It’s so easy, so simple… It has a group calendar, all group email, document sharing, web meetings, group polls, and more! Palbee.com: Palbee is a free online service to set up video meetings, record presentations, store them online and use them elsewhere, such as in your course as video lectures, etc. Overview of Palbee.com. Vyew.com: This website allows you to create meetings and share your desktop during this meeting. Browser-based, so no downloads. Do not seem to be able to use archived webinars elsewhere like with Palbee.com. Overview of Vyew. Wiziq.com: This is an interactive online classroom experience that is free. It is similar to dimdim and other online conferencing tools as it allows for video, audio, and live chat. Students have the options to speak if they have a mic. You can also search for content that you can embed in your own Blackboard class. Overview of Wiziq (pronounced Whiz- I.Q.). Blogger.com: Free online blog tool. Tutorial on Blogger.com. bluwiki.com: A wiki is a website that you or your students can create and all of the people who visit the site have the ability to edit and add content. The main author decides who can edit their pages. Example of a bluwiki. Prezi: Prezi is nothing like you’ve ever seen before. It is a presentation software that creates amazingly visual and stimulating presentations. It is not simple to use and does take some practice. Make sure you peruse the tutorials on the Prezi site to learn more about it. Ahead.com: This is in beta form and seems to be along the same lines as Prezi. Jing: Jing is a tool that allows you to capture your computer screen with voice-over so you can record short (5 minutes or less) tutorials, how to’s or notes to your students on their work. It is easy to share and embed them through a weblink. There is a free version and paid version. Windows and Mac. How to create a Jing. Try www.screenr.com too! Bubbl.us: allows students and professors to collaborate and edit in a brainstorming format, such as making mind maps. 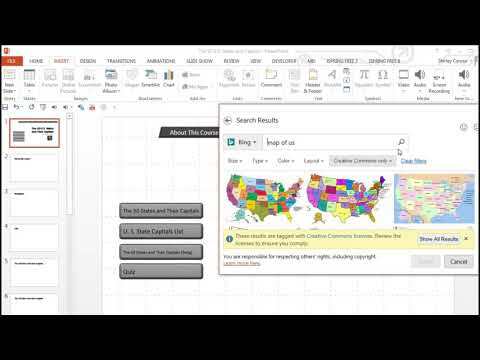 The maps can be embedded in your Blackboard course. Because they’re Creative Commons endorsed, which means you don’t have to worry about copyright. Other Image Sites: Flickr (you must look for the creative commons license before using. Please use their advanced settings); Google Images (again, you must use the advanced settings and next to “return images that are… choose labeled for reuse”); Morgue File– all images can be used for free in academic settings; Compfight- allows you to search Flickr for CC licensed images. Next to the search bar, click Creative Commons until you see the word “only” after it. Incompetech.com: Find royalty-free music that you can use in your course, to include with a video if you use animoto or other tools, or just to have in your course for other reasons. Other music and sound sites: Podsafe Audio (account needed); The freesound project (account needed); The Free Music Archive (beta-account needed); Sound Bible- a place for a great deal of sound bites, sound effects, sound clips, etc. Magma: This new site is really neat! If you really enjoy using videos in your course, this site helps you easily track them. Take a look! IHMC Cmap tools: This is a software program that allows its users to create concept maps. You can construct them, share them, etc. Polleverywhere.com: Students are using their cell phones for pretty much everything, so why not use them for something related to learning? You can use this free resource to create polls to use in class (best for face to face, I think, or during a live chat session). Students vote (via text message) on a poll you create and show to them on a screen! LiveBinders.com: LiveBinders is a lot of fun and great for organizing websites into a virtual binder that you can access and fill very quickly and easily. Once you download it, an icon appears on your desktop. When you’re surfing the net, you can place any site into a binder you’ve created with a few clicks of your mouse. It’s great for storing web resources for courses. Screenstream.com: This program allows you to share your desktop with others via a web link. Not a lot of tutorials out there on this one! Wolframalpha: Ok, this is absolutely amazing. This is a “computational knowledge engine”. Think of it like google meets SPSS meets Encyclopedia Britannica…. Calculate ANYTHING, look up chemistry stuff, physics, get information about what happened when, weather information, you name it, it’s there. Livestream.com: Students or professors can create their own live broadcast across the internet for free!! It’s like having your own TV station. Uses a webcam and mic. Wisc-online these learning objects can be linked through “+external link” in your Blackboard course to help students with different concepts. Search by discipline. Merlot: Multimedia Educational Resource for Learning & Online Teaching. You can search by category, type, and see peer reviews and comments of the various learning objects and exercises. To get the object click “Go to Material” once you’ve clicked on its title. You can link to your Bb course through “+External Link”. Vocational Information Center: this one will take some weeding through, but it is pretty chock full of thousands of learning objects and online resources based upon subject area. www.weebly.com. Create a free website and a free blog. Snap! By Lectora. Developing creative and unique content doesn’t have to break the bank, or your brain. Snap! by Lectora is fast, easy, affordable – and yes, $99. It’s brought to you by the makers of Lectora e‑Learning authoring software so you know it’s good. We provide you with the tools to dazzle your audience and excite your learners in a SNAP! Now, there’s no reason to pay more than $99 for a PowerPoint plugin for rapid e-Learning software. Compare Snap! by Lectora to the other guys who charge $999 and $500 for similar software.